Remember that cooperative weather I referred to earlier? Well, on the day that I had chosen to make my burger, there was none of that good weather. 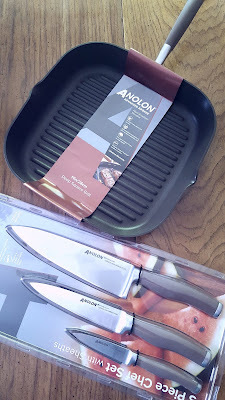 After a brief moment of panic, I pulled out the Analon Deep Square Grill Pan that the company generously sent to the participants in Burger Month. My guys can be grouchy about burgers cooked inside, but they devoured these. The ridged pan allowed the meat to cook perfectly while keeping them juicy. I added the pepper jack cheese and popped them under the broiler to melt it. So good no matter how you top it, but personally, I like to go all in with lettuce, tomato, onion, bacon, ranch, the bbq sauce, plus the crispy jalapenos, covering all the flavor bases! American Lamb Board, Anolon, Cabot Cheese, Crow Canyon Home, Melissa’s Produce, Microplane, New York Beef Council, Red Duck, Spiceologist, Veal Made Easy, and Weber Grills. Be sure to enter the #giveaway for your chance to win some awesome prizes! For sauce: combine brown sugar, ketchup, cider vinegar, whiskey, worcestershire, cayenne, pepper, garlic and molasses in a large sauce pan. Bring to a boil. Reduce heat to a simmer and cook for an additional 15 to 20 minutes, stirring occasionally. Move 1/4 cup sauce to small bowl for basting, reserve remaining sauce. Spray grill grates with cooking spray, or rub down with oil. Heat to high. Add steak seasoning to ground beef, mixing lightly. Divide into 4 patties. Reduce heat to medium-high, and grill patties with the lid down for 6 minutes. Flip gently, and brush the tops with 1 to 2 teaspoons of the reserved barbecue sauce. Close lid and cook for 4 minutes. Add 2 slices of cheese to each patty, close lid and cook an additional 2 to 4 minutes or until cheese is melted. Spread bottom buns with Ranch dressing, and add lettuce, tomato, and onion, if desired. Place burgers on buns. Top each with 2 slices bacon, 1 tablespoon reserved Cinnamon Whiskey Sauce, and crispy jalapenos. Add top bun and enjoy! *Store remaining BBQ in a jar or squeeze bottle in refrigerator, it's great on chicken or pork too. *Cook times are for medium to medium well burger, adjust times for your desired doneness. *Burgers can also be cooked on an indoor grill or skillet, adjust cooking times as necessary. Yummy! I can't wait to try this out. I've been in a burger mode lately so this is perfect. We have too! The guys love them, and there are so many ways to change them up. I love all of the ingredients in this burger especially the fireball whiskey! It's good stuff! I've got a few cocktails I'm looking forward to enjoying on the patio this summer! That looks like a great burger! The fireball whiskey sauce sounds absolutely amazing! It's good on so many things! Crispy Jalapenos!!! How did I not know about this!! Your burger looks fantastic. Right? I use them in salads, on sandwiches or wraps. 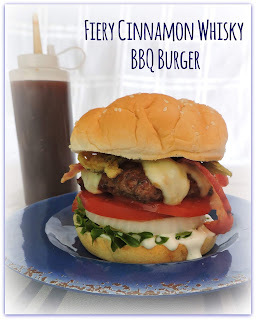 That BBQ sauce sounds amazing - I have a bottle of cinnamon whisky in the cabinet begging for this burger to happen! Thank you! I love having that bottle of sauce stashed in the fridge, it's good on so many things! You have really outdone yourself with this delicious looking burger! I would take a burger over a steak any day and this looks and sounds amazing. Thank you for sharing at the Whimsical Wednesdays Link Party!